Wendy Wischer’s “Wooded III” is part of a series of drawings that use the beam of light from a laser cutter to create the images. The laser beam cuts through the paper leaving a slight burn mark on the edges. Since light is a wave and always moving, what we are left with is the trace of where it has been. The images in this series start out as photographs of tree tops that are converted to simple vector files for cutting out on the laser cutter as well as turned upside down, transforming the images into lace or fringe. 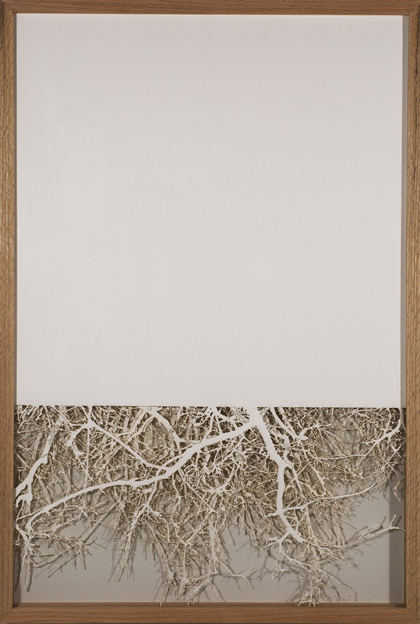 With “Wooded III,” several layers of drawings are complied together, separated by acrylic sheets, to create a physical and metaphorical depth. Wendy Wischer lives in Salt Lake City and received an MFA from Florida State University,1995 and a BFA from the University of Wisconsin Madison,1993. Wischer creates work in a variety of media from sculptural objects, to installations, video and public works. She is one of the 2014 recipients of the Utah Arts & Museums Visual Arts Fellowship. You can see more of her work on display currently in the faculty show at the UMFA.